Brody and Associates, LLC is proud to announce Lindsay M. Rinehart was the winner of one of Fairfield and Westchester County Business Journals’ 2018 Milli Awards. This award honors outstanding millennials chosen by a panel of judges. Lindsay was selected based on her creativity, hard work, and dedication to changing the face of our communities. Brody and Associates congratulates Lindsay on this accomplishment! On October 25, 2018, the Fairfield County Medical Association held its annual Physicians Extraordinaire Awards Ceremony. Brody and Associates served as a silver sponsor. Brody and Associates is proud to support the FCMA and the physicians who provide medical care to our communities. 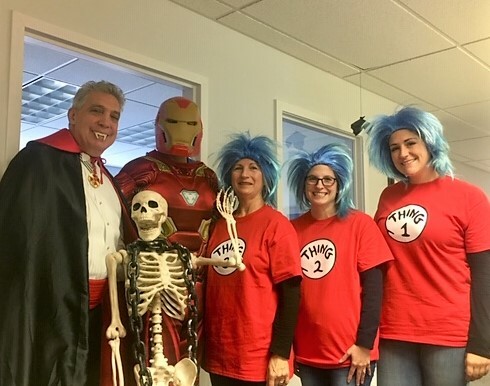 On October 31st, Brody and Associates had a visit from Iron Man, Dracula, and Thing One, Thing Two, and Thing Three from Dr. Seuss’s The Cat in the Hat book. These visitors added some special fun to the Firm’s legal work for the day.